Illustrated with color photos on every nearly page, the book is accessible to a general audience while discussing the latest scholarly research. 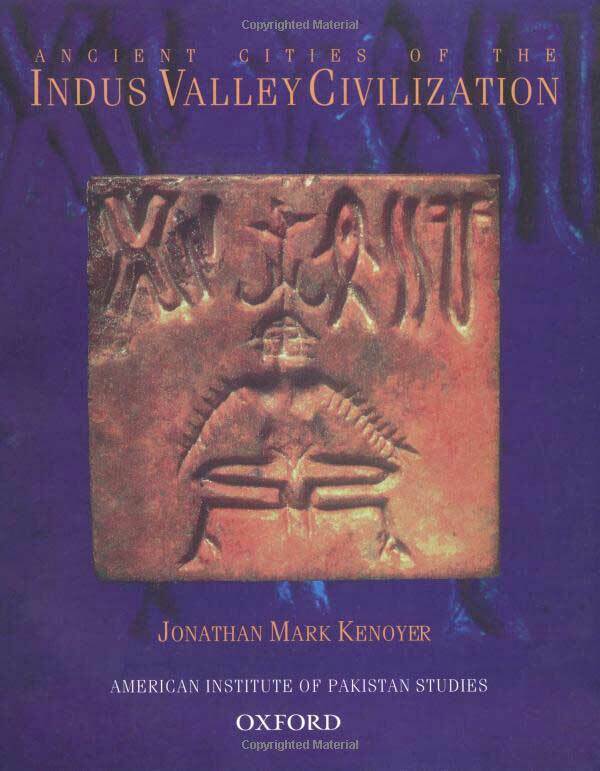 The fifty page Appendix to this volume is a catalog to objects in the US Indus Valley Exhibit 1998-1999. Born and raised in India, Dr. Kenoyer is now a Professor at the University of Wisconsin in Madison, and has been leading excavations at the ancient site of Harappa in Punjab, Pakistan for over a decade. He has worked with local potters to rediscover complex ancient Indus pottery manufacturing (far more advanced than today's). He worked with craftspeople in Gujarat to replicate the long carnelian beads once prized in the ancient world. Most recently, he was Curator of the first US Great Cities, Small Treasures: The Ancient World of the Indus Valley Exhibition presented by the Asia Society in New York. Unlike most Indus archaeologists, Kenoyer's analysis relies on cold evidence from the field to draw the outlines of a civilization far more interesting than people have imagined. Much larger than ancient Egypt or Mesopotamia, the hallmark of its people were well-organized cities instead of temples and palaces. Small, immaculately constructed objects like seals and beads seem to have been the most highly valued cultural objects. Terra-cotta ceramics were fired at high temperatures to make stoneware bangles using technologies re-invented only centuries later in China. There is little evidence of warfare. The same weights and measures were used for over a thousand miles, an incredible feat in the Bronze Age. Indus traders set up flourishing colonies in the Gulf and Mesopotamia; no evidence of the reverse has yet been found. One of the best things about Kenoyer's book is how intimately it links the ancient Indus and modern subcontinent. While the demise of the civilization remains unclear, its elements have survived in so many ways - whether in the tikka women wear on their foreheads to prototypes of Hindu gods or current Punjabi burial practices. Even the 16 annas to a Rupee monetary system, used until recently from Dhaka to Peshawar, seems to stem from base eight Indus mathematics. Kenoyer spells out what we do know and what we can still only guess at, like the looming but undeciphered script. Since Sir Mortimer Wheeler's The Indus Civilization, written fifty years ago, there has been no similar comprehensive book. Unlike Wheeler and others, Kenoyer does not impose theoretical or religious biases on fuzzy evidence. Exciting work continues at Harappa, and at sites in India like Dholavira and Rakigarhi; both are near what may be the lost Sarasvati River, which once ran parallel to the Indus and may have been equally important. The largest known Indus culture site, Ganweriwala in Pakistan's Cholistan desert, was only found in the late 1970s and has yet to be excavated. In short, there is so much more to discover for an intelligent archaeologist to risk having their conclusions soon made obsolete. Indeed, Kenoyer's own excavations are moving ahead of the book. Recent findings at Harappa have brought to light traces of a new pre-Indus phase, called the Ravi phase, after the river that once flowed between the site's ancient mounds. A few months ago, evidence for the origins of Indus writing was discovered at Harappa that may reach back to 3300-3500 B.C. This suggests that the ancient Indus script developed independently of what has long been thought to be the world's first writing, from ancient Mesopotamia and Egypt at roughly the same time. Its development also seems to have had a very different trajectory. One can barely imagine the other surprises that await Indus archaeologists beneath the ground. We can be sure, though, that they will rewrite our understanding of ancient human history. This book is a major step in that direction.